And while some already argued that less means more (less time means better results), I explained that it’s more complicated than that. E.g. 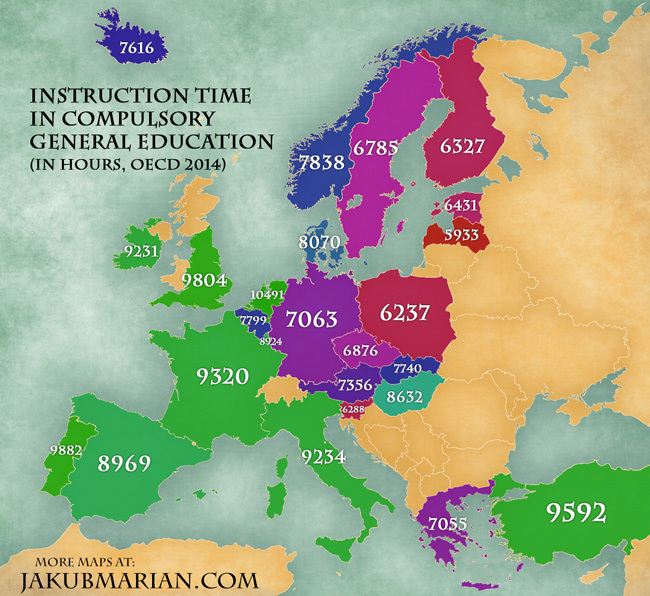 Germany did better at the last PISA-results in part because they added more instruction time. This new study adds a complication to the instruction time-learning-link: spending more time at school benefits the best-performing students disproportionately. The researchers used data from the Early Childhood Longitudinal Study – Kindergarten Cohort (ECLS-K). This included more than 20,000 children from 1,000 kindergarten programs in schools for children who entered kindergarten in 1998. Children were given math and reading tests in the fall and spring. Because there was essentially random variation in when these tests were delivered, there were variations in the amount of instructional time between the two tests. The researchers used this to analyze the progress made, but also the difference in progress among the different percentiles within the class. They found that, on average, reading scores increase by 1.6 test score standard deviations (SD) during a standard 250 day school year. However, readers in the bottom 10% increased by only 0.9 test score SD, while those in the top 10% increased by 2.1 test score SD. A similar result was found for mathematics. The authors suggest that policymakers, practitioners, and analysts must consider the average and distributional impacts of educational inputs and interventions.